After finishing the assessments in Wales we spent a week in Coventry finalising the questionnaires and discussing the results. On Tuesday 11 Alfréd participated and presented the Hungarian results of the study at an international conference on permaculture. More information can be found at here. 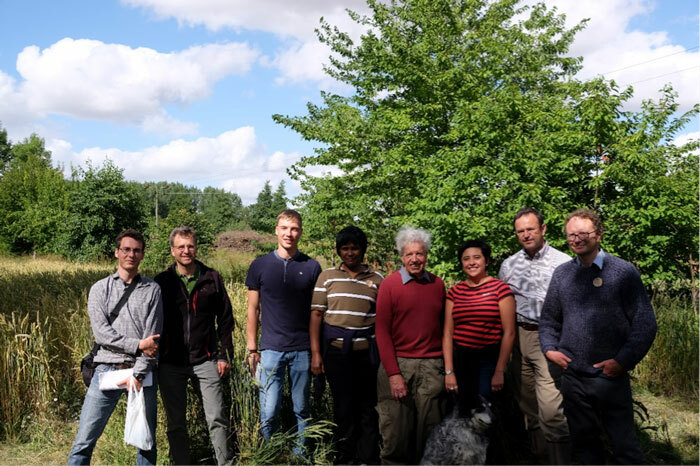 Picture 1: Students and members of staff from CAWR together with Dr. Martin Wolfe (5th from the left) at Wakelyns Agroforestry. The rest of the week passed organising the remaining farm visits in the south. [Week 5 and 6] The last two weeks of exploring the sustainability of UK farms in the southwest of England. (July 17 – 23). On Saturday 15 Alfréd left Coventry and headed South to visit Keveral Farm where he had previously spent an internship in the summer of 2015. This time round he stayed there for a week volunteering for Oli Baker, the manager of Ollo Fruit farm (http://www.ollofruit.com/), and doing the assessment of the farming system. 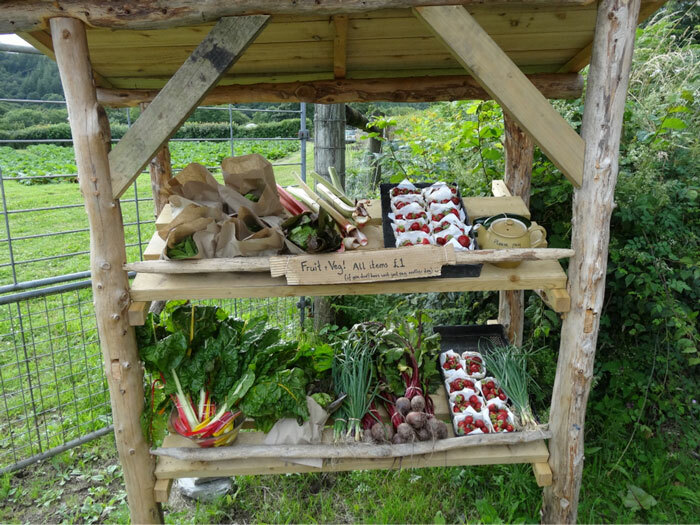 Oli produces high quality organic soft fruits (currants, strawberries), rhubarb and vegetables for a local box scheme run by Keveral Farm, and also for local restaurants, cafés, and wholesalers. He managed to get hold of a property with land only last year. Alfréd’s visit caught him at the busiest time of year while he was setting up the new farm. Oli came across as a very enthusiastic young farmer dedicated to sustainable farming no matter whether called organic or permaculture. It will be worth looking at how the new farm develops in the years to come. Whilst staying at Keveral Farm Alfred also assessed John Ridout’s Penbugle Organic Farm (http://penbuglefarm.co.uk/) on Friday 21. John’s main focus lies in animal production: laying hens, beef cattle and lamb, all certified organic. They also have a campsite on the farm, so if anyone is planning a journey to the Cornwall coast, the farm is definitely worth keeping in mind. On Saturday July 22 Alfréd left Keveral Farm and crossed Dartmoor National Park arriving at Embercombe Farm on Monday 24 (https://embercombe.org/). 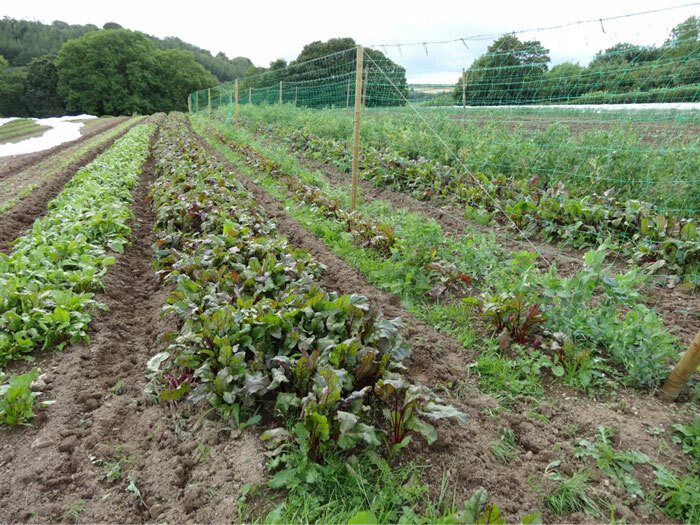 Keveral Farm is an inspiring organic and biodynamic certified farm. Besides growing, their main focus is ‘people care’, they offer courses, camping for youngsters, internship programmes and all sorts of projects that aim at sharing the benefits of participating in a community and demonstrating low impact living. It is a project worth visiting if you want to escape from everyday hassles and have a break for self-reflection within community life. Their farm consists mostly of vegetable plots and an apple orchard. They are trying to cover the food needs of the people living on the farm. Any surplus produce is sold to a local café and seeds are sold to the Seed Cooperative. 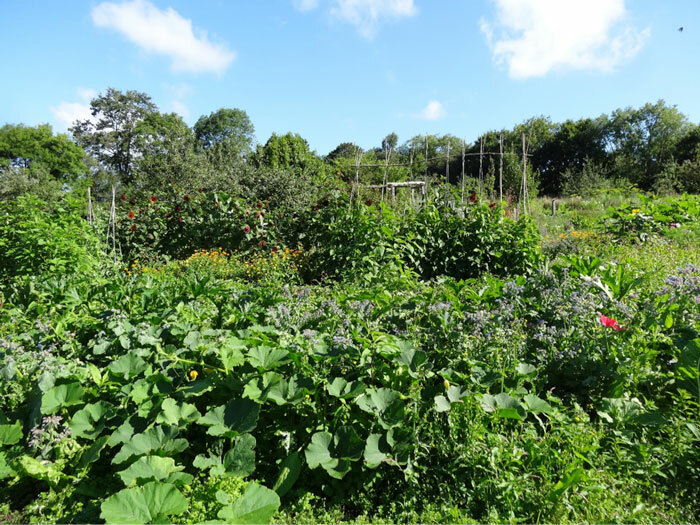 The second growing area of Embercombe Farm is a herb garden. 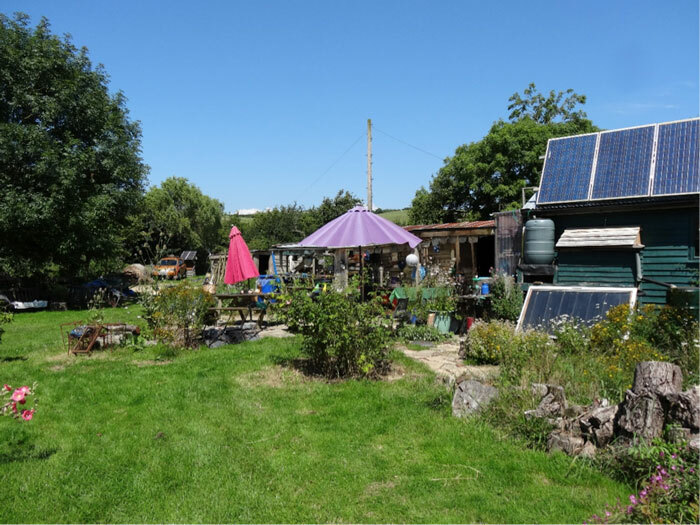 At Embercombe it was very inspiring to see that even though the term ’permaculture’ isn’t used what they do is in accordance with the ethos of permaculture: the growing in polycultures, the care for land and people. We believe their project is useful to demonstrate what the benefits for the community are through this approach. 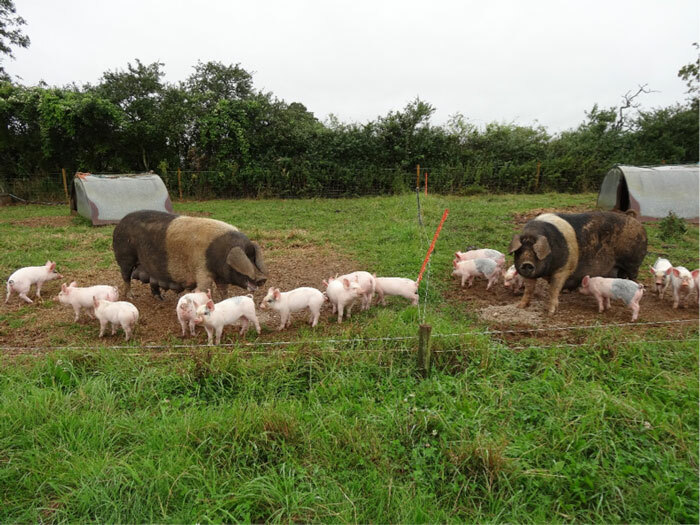 On July 25 the next farm to visit was Ourganics, a project run by Patricia Bowcock, one of the many inspiring projects we came across during our research in the UK. 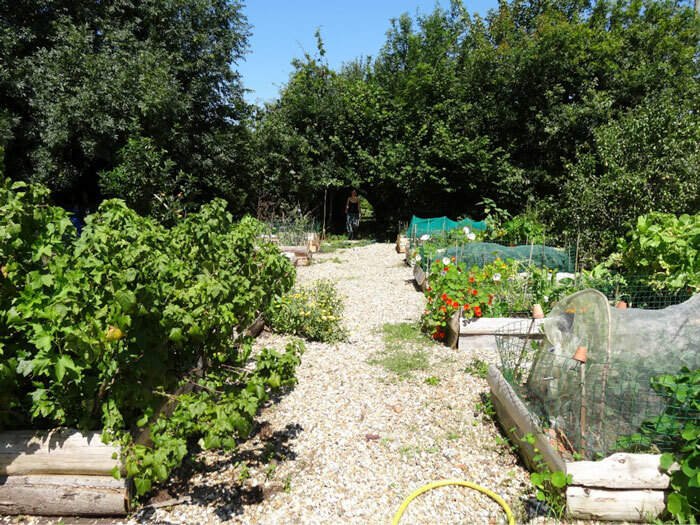 Patricia got to know the term permaculture and its ethics around 27 years ago; since then she has dedicated herself to demonstrating how permaculture ideas can work in practice. 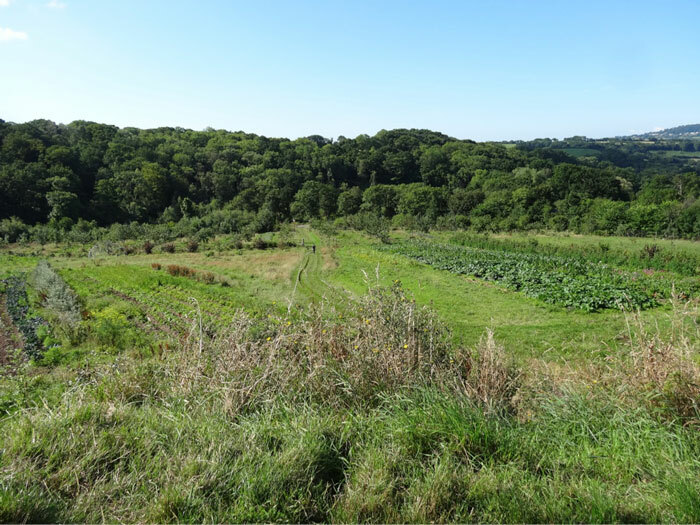 She leads an off-grid, low-impact life on her 5 acre smallholding near Dorchester. More information: https://www.permaculture.org.uk/people-projects-places/project/ourganics-evolving-systems and here a video with Pat and also a video of the farm: http://www.learnpermaculture.com/courses/courses/permaculture-livelihood-2day. She offers courses on the farm with various possibilities to get involved in her project. She claims there are over 2000 visitors a year. If someone wants to see practical solutions for living a low-impact life on a small holding she is definetely one of the best examples to explore. Pat is also a senior grower producing amazing veggies and salad crops for local customers and cafés in her small but high-yielding veggie plot. Alfréd was very impressed by her work and her lifestyle, definitely worth a visit. 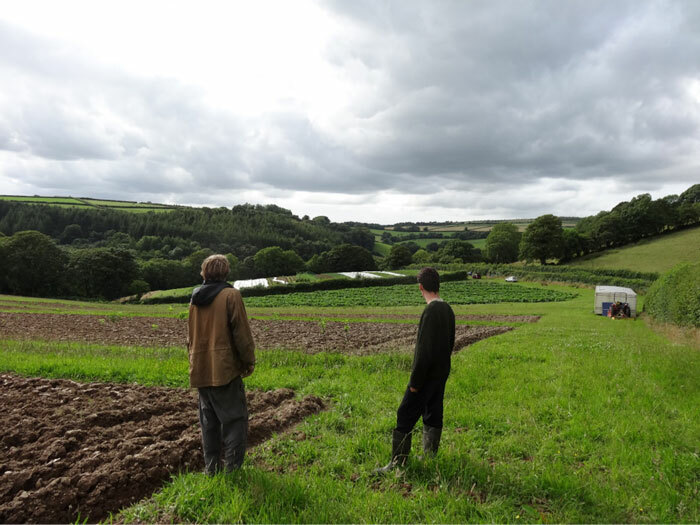 Finally, on Wednesday July 26, Alfréd travelled from Dorchester to Glebe Farm; a fourth generation organic farm near Glastonbury managed by Rob and Lizzie Walrond. 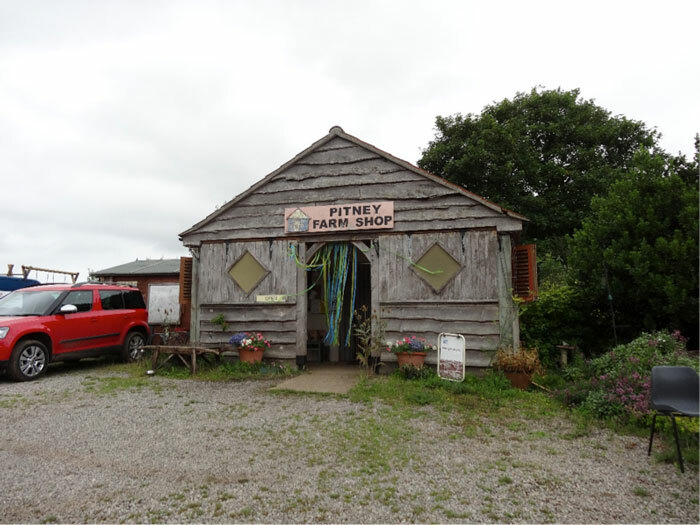 This was the last farm of the research project http://www.pitneyfarmshop.co.uk/ . 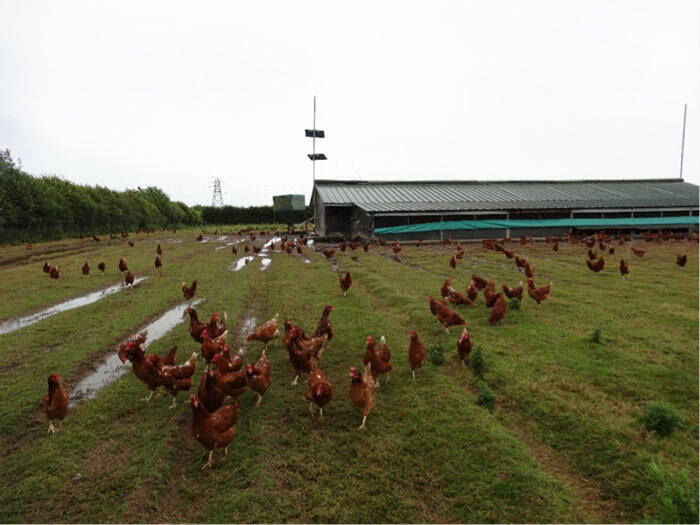 The farm focuses mainly on animal production and diverse species: free range laying hens, pigs, lamb and beef cattle. 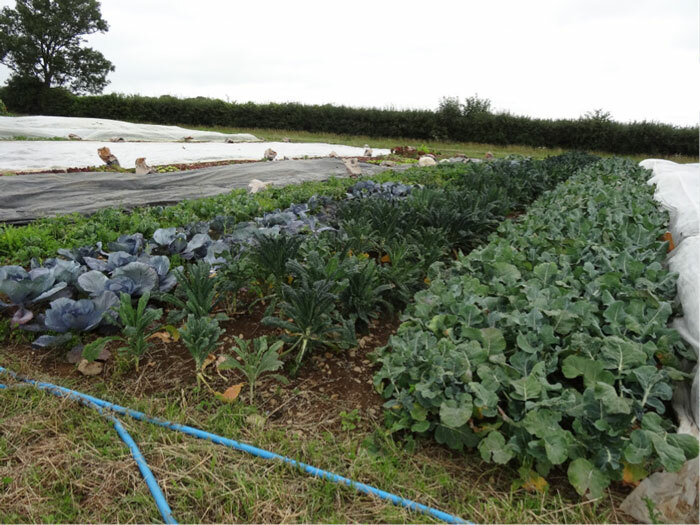 They also run two acres of vegetable production which is sold from the farmshop and through wholesalers and retailers. We had a warm welcome from their permanent employee, Adam Beer, an inspiring and enthusiastic young grower. After completing the questionnaire we had a chance to get involved picking beans for the shop. Free range pigs at Glebe Farm. 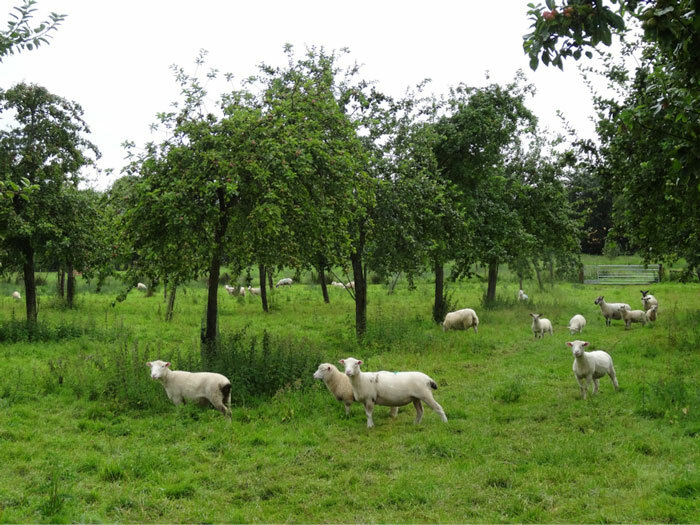 Traditional sylvopastoral system at Glebe Farm, sheep within an apple orchard. In the afternoon Alfréd returned to Coventry and for the rest of the week finalised the questionnaires and compiled the results to get a preliminary picture of the study results. We hope you enjoyed the trip with us and got a bit of an insight into small-scale conventional, organic, permaculture and alternative farming systems. It has been an intensive six weeks travelling and talking to farmers. Now that we have the data and results to work on the second big stage of the work consists in making sense of it and converting it into publications. The field work for the project ended here. Alfred will explore Lammas Ecovillage in Wales next week but that is not part of the formal research as he won’t make any assessments. 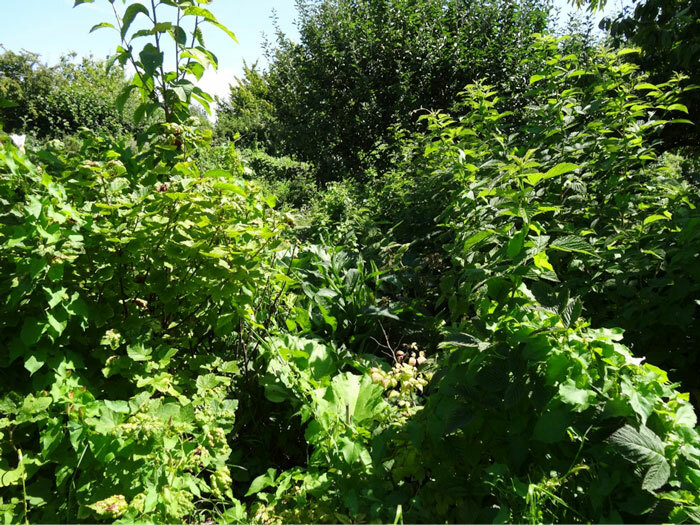 He will explore a very interesting group of people focused permaculture and see how permaculture can work on a community scale in an ecovillage. All in all it has been an inspiring few weeks exlporing farms all around England and Wales. A big THANK YOU to all the farmers who made their time available and opened their farms to support our research. Also thanks to the Centre for Agroecology, Water and Resilience (CAWR) for supporting the project finanicially. The results will be hopefully published by the end of this year. i’d have been saved the unnecessary measures we were employing.